Political chief of the Tamil Tiger rebels, S.P. 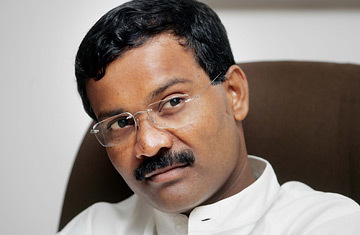 Tamilselvan, in 2006. "Ethnic Cleansing" in Sri Lanka? The Sri Lankan Air Force says it killed senior Tamil Tiger leader S. P. Tamilselvan and five others in an aerial attack Friday morning. A statement put out by the Liberation Tigers of Tamil Eelam (LTTE), who have spent more than two decades fighting the government of Sri Lanka in an attempt to create a Tamil homeland in the north and east of the Indian Ocean island, confirmed Tamilselvan's death. The news  the attack targeted a residential complex where members of the LTTE were meeting  makes the possibility of a negotiated political end to the country's brutal civil war much less likely. Tamilselvan was the head of the LTTE's political wing and the international face of the group. He had been involved in negotiations with the previous Sri Lankan government along with the LTTE's then chief negotiator Anton Balasingham. When Balasingham fell ill and later died, Tamilselvan took over as head of the LTTE team and met with representatives of the current government in Geneva last year. His death means the LTTE has lost both of its main negotiators and, with the country sliding towards a full scale war, it is likely that the LTTE military wing will seize the initiative in deciding whether to fight on or begin fresh talks. Suresh Premachandran, an MP from the Tamil National Alliance, which is considered a proxy of the LTTE, told TIME the death of Tamilselvan will be a blow for the negotiation process. "It shows the Government is for a military solution. Tamilselvan was the leader of the political wing and involved in all rounds of negotiations, so when the Government targets him it is clear they do not want a political solution," Premachandran said. The government said the successful strike proved the superiority of its air power and intelligence. The director general of the Media Center for National Security, Lakshman Hulugalle, said the aerial attack also showed that a recent Tiger air attack on a key government air base had not seriously compromised Colombo's air force. "As far as we are concerned, it is a morale boost for the government and we have got another LTTE leader," says Hulugalle. "It also showed that the Air Force has not lost its capacity to strike." Defence Minister Gotabaya Rajapaksa, President Mahinda Rajapaksa's brother, told Reuters that the successful assassination was "a message that we know where their leaders are ... if we want we can take them one by one." The timing of the attack is also not without significance since it comes just three weeks before Tiger Leader Velupillai Prabhakaran makes his annual "Heroes Day" speech on November 27. The elusive Prabhakaran uses the speech to set out his organization's direction and he likes to do so having scored some victory against the Government. The LTTE's attack on the air base gave him that, but today's attack evens the scales. The next few weeks could get very bloody.